Ah, there’s nothing like a good romance. In celebration of Valentine’s Day on February 14, here’s a round-up of some book-related gifts you might consider for that special someone. And if you’re single this year, hey–there’s nothing wrong with getting yourself a little something, too! Many of these are handmade gifts chosen from Etsy. If the item is sold out, don’t forget that you can always contact the seller to see if there’s another one available. Some sellers will also ship directly to the participant, which is great if you’re in a hurry. You could even create a custom Gelaskin cover for a E-Reader, phone, or laptop cover using your valentine’s favorite book. 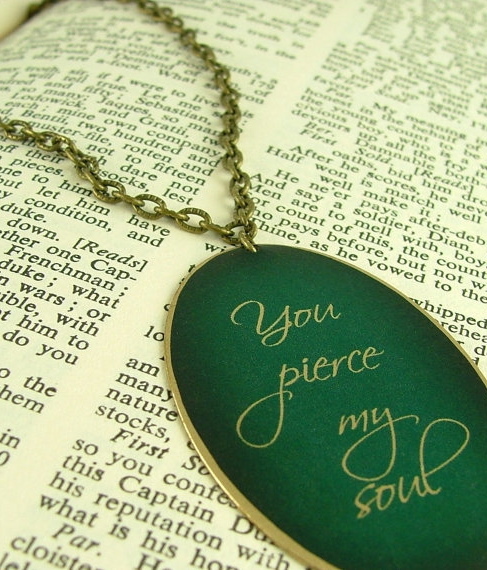 Hope you enjoyed browsing these bookish Valentine’s Day gift ideas! I post similar finds on Pinterest all the time, so feel free to connect with me there if you haven’t already. What romantic plans do you have for your sweetie this year? Send gifts to pakistan when i needed. Thanks for these gift suggestions. I am interested customized gifts. 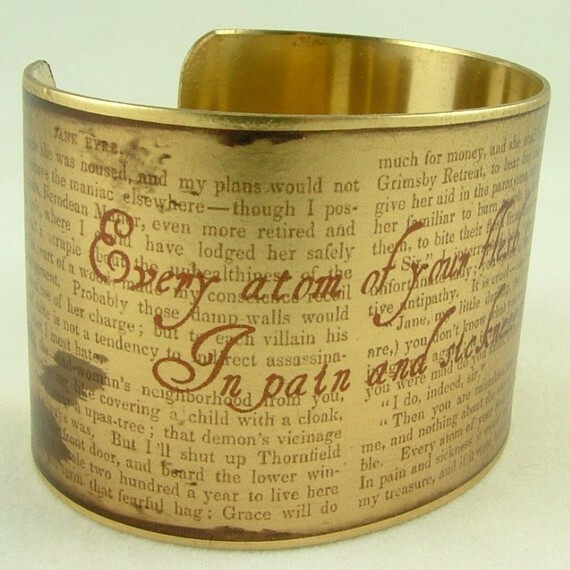 I want that Jane Eyre cuff! So pretty. Oh my goodness! I love the Personalized Love Letter Cookies!!! It’s super cute! I love the others too but the love letter cookie is at the top! Thanks for sharing this, Wendy! I think I will have to send a love letter cookie someday. :) Glad you enjoyed, TSQ! That was totally a Jace quote up there, and I STILL swoon and get all tingly when I read it, even if it was in a completely awkward context at the time!! Such a great fun post, so many good gift ideas–I want. 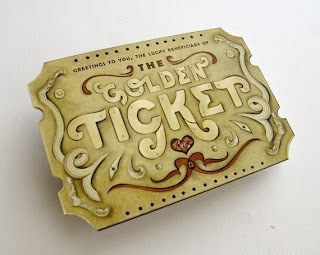 I especially loved the Jane Austen Bewitched print and the Golden Ticket valentines. I can’t decide which item I like best..well the cookie is kind of winning me over but that clockwork angel necklace wow! Thanks for the great post of ideas! Hah, it’s funny how these gift ideas sometimes turn into shopping lists. 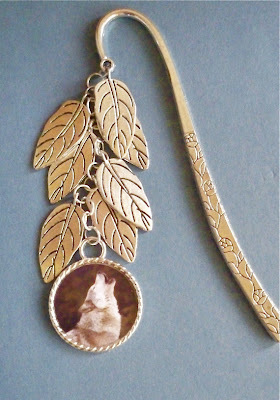 I will give in and get myself at least one of these items sooner or later! Oh my! Great ideas for gifts. My personal fave was the tea towel. 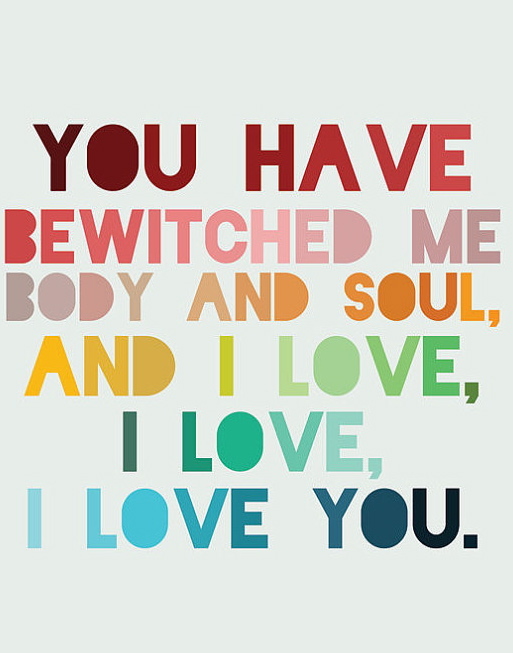 Mr. Darcy is just so… Sigh. He is pretty swoon-worthy. :) There are a lot of great Austen quotes on gifts, it was kind of nice to see as I was browsing. 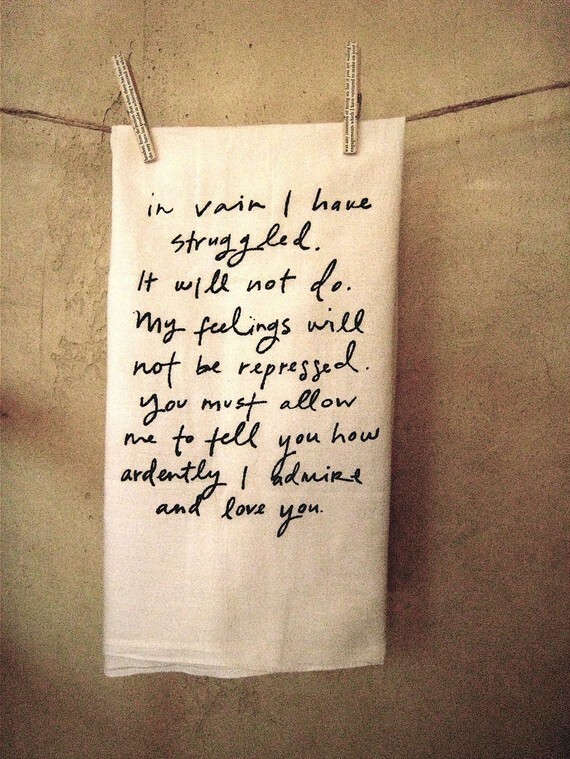 Brilliant tea towel. I love it. So romantic. It really is. It’d be awesome to have it as a scarf or something like that, too–the handwriting is just gorgeous! Oh wow! I love these! I’m not sure which one is my favorite or that I want the most! So many awesome ones! These are all seriously amazing, but that cookie is the best! I love it! Excuse me, I meant Jace Wayland! But if you’ve read TMI, you know why I had Herondale on the brain. Oh my goodness. I LOVE Mr. Darcy’s towel, and the love letter cookies. All of those ideas are so cute. Good ol’ Valentine’s Day. I love the golden ticket but all of those gifts would be pretty special. I’d love to receive any one of these things, too. :) Thanks for stopping by, Karen! I love this post! All of these bookish gifts are so unique. I especially love the Jane Eyre bracelet. Thanks for sharing all of these goodies. Oh thanks Steph! I love bookish gifts, I wish these things were more widely available in stores…but at least they’re easy to order online. :) Happy shopping! I’m team.. cookie over here, LOL! Oh man, if I figure out how to get Jace to send you a love letter…will you get Will Herondale to send one to me? I tend to gravitate towards food too, Lauren. :) Happy Valentine’s Day to you! OH how cute! 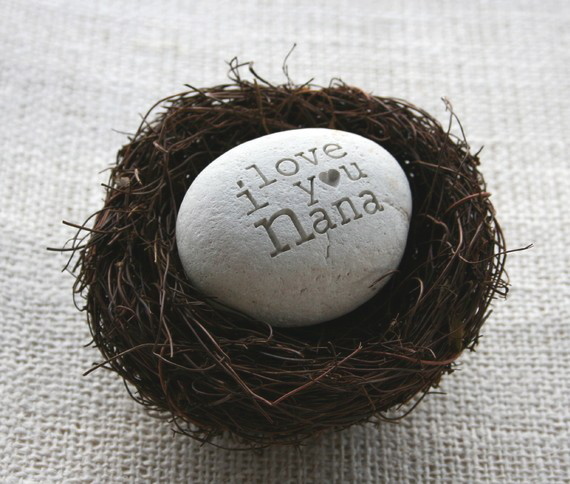 I loved homemade customize gifts! I do too, I used to make a lot of gifts myself…but I’m too lazy these days. I always love getting homemade presents and food, though. Oh my god these are all awesome! That pillow rocks, like seriously! >.< I love the necklace too! And.. a love letter COOKIE!? Now THAT is just plain fabulous!! so beautiful! I would like to have them all! I love the Tessa’s Clockwork Angel Necklace, it’s so gorgeous! I thought that was really lovely as well. 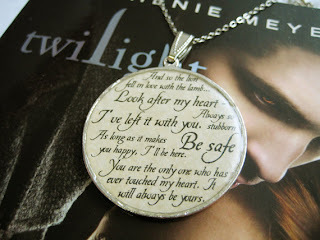 :) Lucky Tessa, to have a pretty necklace AND two wonderful boys! I think I’ll hint for the love letter cookies. So, so adorable. Thanks for this lovely post! 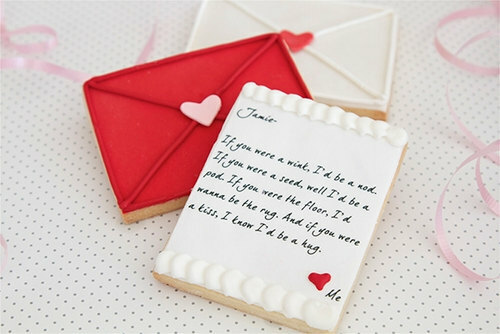 It’d be sort of funny (but sweet) if one of those love letter cookies made it out of the house and someone found it. :) Glad you enjoyed! I love the Clockwork Angel necklace and the Jane Eyre bracelet. They are so pretty. 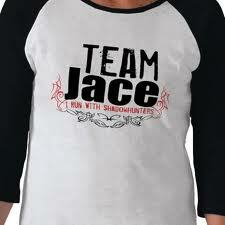 I also love the Team Jace shirt, because who doesn’t love Jace? I love those, too. :) I basically pulled a bunch of stuff from my own personal bookmarked list, hah! Jace is a charmer for sure. I know some people don’t like him, but I’m a fan.